After Thanos’ victory in Infinity War, it’s a good bet that Earth’s Mightiest Heroes will resort to desperate measures to defeat him. Speculation and Endgame fan theory has it that the remaining heroes will try to undo the snap via time travel. While Russos aren’t talking much, many set photos seem to back this train of thought up. Infinity War Teaser Actually An Endgame Trailer? However, according to Reddit user BigMartin58’s theory, what we thought was a teaser for Infinity War may have been a trailer for Avengers: Endgame. When Infinity War came out, many scenes didn’t make the final cut. 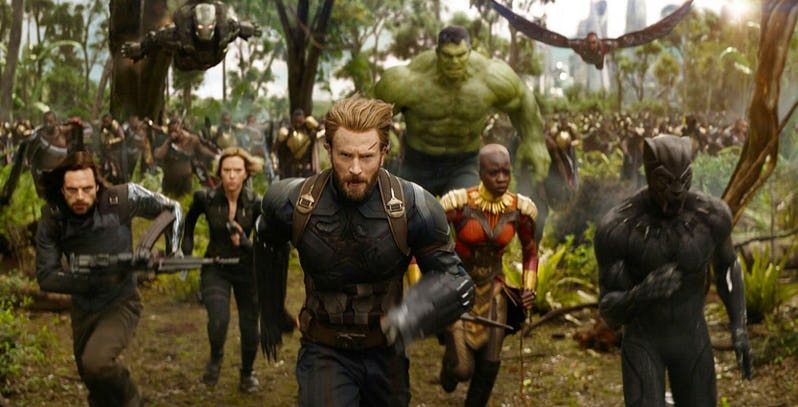 According to the Russos, some sequences were inserted into the film’s marketing to throw the audience off. While other scenes were simply edited out in post-production to serve the narrative better. However, if time travel does play a central role in Endgame, it’s possible that the past could be altered to something that does resemble some of Infinity War’s altered scenes. The first change that’s in question at 1:00 mark in the trailer where we see Tony Stark taking off his shades with his colleagues in the background. This is during the battle of New York where Cull Obsidian and Ebony Maw come to claim the Time Stone. However, in the film, by the time Stark removes his glasses when his armour is forming around his body. The trailer has him still in his black top before he armours up. Now, could this from an Endgame scene where Stark feels he doesn’t have to rush to become Iron Man. However, odds are this is a case where the final effects weren’t over by the time the trailer hits. At Infinity War’s 1:20 mark in the trailer, we see Chris Evans’ Captain America catching the spear hurled by Midnight Proxima. In the trailer, it’s a very dark scene where you only see Cap’s silhouette. However, in the film it’s fully lit. In Infinity War, there’s a huge window behind him with street lights shining through the glass. So it makes sense he’d be illuminated there. As of this trailer, it’s obvious Cap’s back is against the wall with no lights. This indicates a slight change of scenery for this face-off. There isn’t much to suggest time travel, but it’s somewhat interesting nonetheless. The first strong argument comes at 1:44 in the trailer. This is when Thanos arrives on Titan with just the Power and Space Stone in the Gauntlet. We know he had the Reality and Stones at this point in the film, but these obviously may have been major spoilers in the trailer. So it’s safe to assume they got edited out. But if the heroes of MCU do tinker with the time stream, there’s a chance they’d be able to save Gamora. Perhaps, even preventing her from getting captured on Knowhere. Even if they rescue the Collector, it would leave the Mad Titan without the latter two stones. This could be a plausible scenario, if getting the stones is a primary objective. At 2:00, there’s the famous “charge” moment where heroes go after a villain we never see. The Russo bros have said that it was just created for the trailer. In the film, we don’t see the heroes in the forest, but an open field in Wakanda. Moreover, we see Hulk right there in the Infinity War trailer. If time travel happens, and Bruce Banner is able to fix his issues with the Jade Giant, that’d be only way Hulk could be primed for battle. Using time travel to bring Hulk back to fight Thanos would be a smart move, but a new strategy would still be needed in Endgame. These notions do seem pretty intriguing and it’s unlikely all these will be affected by messing with time. Odds are what the Russos claim- extra pieces designed to mislead the audience of the true story. All questions will be answered when Endgame hits the theatres on April 26.